in the reconstruction of the Donbas. US "disappointed" by Poland's enactment of law criminalizing attribution of Nazi crimes to Polish state. Dodon threatens to punish the measures that have signed the declaration on association with Romania. Employees of the Federal Security Service of Russia are involved in the shooting at Maidan. This was announced by former head of the Security Service of Ukraine Valentyn Nalyvaichenko during a questioning at the Obolonsky court in Kiev. "Representatives of the FSB of Russia were on the Maidan. They gathered near the October Palace. Russian chevrons were covered with Ukrainians", - said the former head of the SBU. "I did not see the weapons on the Maidan among protesters and did not have weapons at all." Nalyvaichenko also told that FSB officers of Russia had arrived in Ukraine three times in the period from December 2013 to January 2014. On February 7, in the Obolonsky court of Kyiv, three witnesses were questioned in the case of state-run former President Viktor Yanukovych: Andriy Tsymbaliuk, Valentina Nalyvaichenko and Igor Tenyukh. Previously, the court session was postponed . The judge then noted that the judges agreed with the prosecution that the lawyers violated the reasonable time frame for the criminal proceedings. Earlier, the case of Yanukovych's treason was questioned by former head of the Ministry of Foreign Affairs Andriy Deshchytsia, Speaker of the Council Andriy Parubiya, as well as Interior Minister Arsen Avakov and former Prime Minister Arseniy Yatsenyuk. Also, Yanukovych's court questioned the four guards of the ex-president. In December last year, the court ruled to challenge President Petro Poroshenko and other high-ranking officials as witnesses in the state-run case of former President Viktor Yanukovych. This is reported by the press service of the SBU. Investigators found that a resident of the Odessa region in June 2014, a group of 20 mercenaries was trained in one of the military training ground in the Rostov region of Russia. After that, the militant was enlisted in one of the illegal armed units of the "DPR". In July 2014, he fought against the forces of the ATU on the advanced positions of terrorists in the Mining District of Donetsk Oblast. During his husband's stay in Russia, he was recruited by FSB officers. He received a task to return to the Odessa region and collect information about the situation in the region, in particular, near Transnistria. The spy also had to work out illegal channels of penetration into Ukraine from the Transnistrian region of Moldova. The action was announced on suspicion under Part 1 of Art. 258-3 of the Criminal Code of Ukraine (the creation of a terrorist group or terrorist organization, the leadership of such a group or organization or participation in it), he was arrested. The government of a great coalition in Germany intends to continue to support Ukraine on the path of reform and seek to restore its territorial integrity. These intentions are set out in the draft Coalition Agreement of the Christian Democratic and Christian-Social Unions, as well as the Social-Democratic Party, told Ukrinform a reliable source. "We will be committed to supporting Ukraine in terms of the full restoration of its territorial integrity, strengthening of stability and social development," the 177-page document approved by the leaders of the three parties was approved on Wednesday. It states that the signatories "expect and encourage the consistent implementation of the reform program in Ukraine, in particular the fight against corruption for the purpose of comprehensive modernization of the country." The future government of Germany simultaneously warns that it will provide financial assistance under harsh conditions. 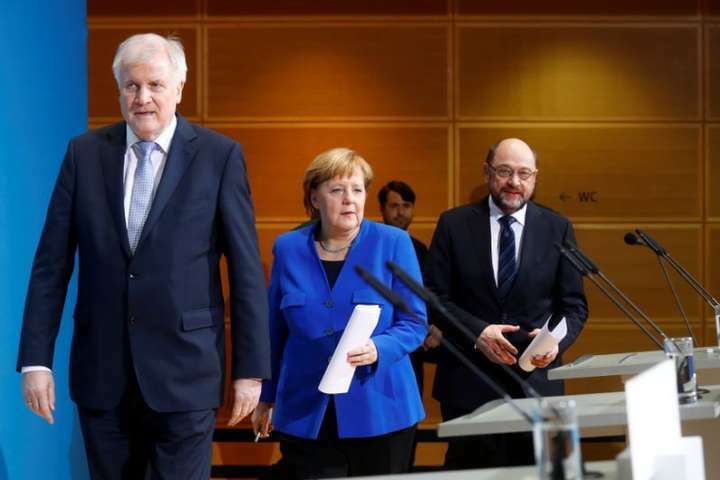 The document also states that Germany is ready to take a large part in the reconstruction of Donbass, as soon as it makes possible "significant steps towards the implementation of the Minsk agreements". With regard to the arrangements itself, Berlin, together with Paris, intends to continue to actively promote their implementation and seek to resolve the conflict. It is in the case of the implementation of the Minsk agreements that the German government will "be ready to abolish anti-Russian sanctions" and talk about it with its European partners, says the treaty. It also reminds that Russia's illegal annexation of Crimea and "interference" in the east of Ukraine violated European peaceful order. "The current Russian foreign policy demands a special care and resistance from us," the document says. At the heart of this is compliance with the truce in eastern Ukraine and the withdrawal of all heavy weapons. It is noteworthy that the German parties have stated that "such development should be ensured by the UN mission". Ukraine and Russia have to fulfill their obligations under the Minsk Agreements. The United States is disappointed by the intention of the Polish President Andrzej Duda to sign the amendments to the draft law on the Institute of National Remembrance banning any claims that the Polish people or Polish state were responsible or complicit in the Nazis' crimes, crimes against humanity or war crimes thus criminalizing allegations of the Polish nation's complicity in the Holocaust. Censor.NET reports citing a statement by U.S. Secretary of State Rex Tillerson. "The United States is disappointed that the president of Poland has signed legislation that would impose criminal penalties for attributing Nazi crimes to the Polish state. We understand this law will be referred to Poland"s Constitutional Tribunal. Enactment of this law adversely affects freedom of speech and academic inquiry. "The United States reaffirms that terms like "Polish death camps" are painful and misleading. Such historical inaccuracies affect Poland, our strong ally, and must be combatted in ways that protect fundamental freedoms. We believe that open debate, scholarship, and education are the best means of countering misleading speech," the statement reads. On Jan. 26, the Polish Sejm adopted the bill submitted by the Kukiz'15 party setting a ban on promoting the so-called "Bandera ideology," with its historic roots stemming from Ukraine. In this regard, the Ukrainian Foreign Ministry expressed concern, saying that Poland was trying to portray Ukrainians as "criminal nationalists." The Israeli Foreign Ministry, in turn, called Deputy Ambassador of Poland in Tel Aviv for explanations in connection with the amendments in the draft law on the Institute of National Remembrance. In particular, it bans any claims that the Polish people or Polish state were responsible or complicit in the Nazis' crimes, crimes against humanity or war crimes thus criminalizing allegations of the Polish nation's complicity in the Holocaust. In the early hours of Feb. 1, the Polish Senate passed the draft law on the Institute of National Remembrance of Poland, which, among other things, provides for punishment for denying the crimes of Ukrainian nationalists (supporters of the so-called "Bandera ideology"). The vote took place at 3 a.m. Kyiv time. The bill was backed by 57 senators without amendments, while 23 were against it, and two more senators abstained. Polish President Andrzej Duda signed the bill amending the law on the Institute of National Remembrance on Feb. 6. "I am not against any states, whether it is Russia or Romania, but I am against those who want to get rid of the Moldovan state," Dodon said. The heads of at least 10 Moldovan villages have recently signed a symbolic document to the centenary of the unification of most modern territories of Moldova with Romania at the end of the First World War. Dodon condemned the declaration and criticized the intelligence service of Moldova, the Ministry of Internal Affairs and the prosecutor's office for not taking measures against the mayor-signers, although they knew that the mayors violated the existing laws. The president also said that the mayors of 53 other settlements signed another statement - against the association with Romania and for the maintenance of the state of Moldova. Earlier, Dodon said that the idea of ​​uniting Moldova and Romania could lead to a civil war. On 3 February, the Mayor of Saysin, Calarash district, and the local advisers in Moldova, adopted a symbolic declaration on association with Romania. In Russia, the deputy health minister of Tatarstan Elena Shishmarev, who was suspected of stealing budget funds, was found dead. Tass reports with reference to the source. According to him, Shishmariev was found dead at home. It is specified that on February 3, the Soviet District Court of Kazan sent her under house arrest for two months. As reported by the investigation, Shishmareva demanded that employees of the economic departments of medical institutions undergo advanced training courses in the ANO "Progress". If they refused to do so, she did not sign documents to allocate the necessary funds to the medical institutions. So, from 2015 to 2017, with Progress, about 300 contracts worth about 8 million rubles were concluded. The RF Investigative Committee filed a criminal case under Part 4 of Article 159 of the Criminal Code "Theft by fraud" and Part 1 of Art. 286 of the Criminal Code "Excess of official powers". Shishmariev took place in the case as a suspect and did not admit his guilt. On Wednesday, February 7, passengers of the flight Krasnoyarsk-Moscow kept for two hours in a plane with an open door at a temperature of -16c degrees due to President Vladimir Putin. This is reported by the Moscow service "Radio Liberty". So, Putin arrived in Krasnoyarsk to "hold a meeting with representatives of big business" and "get acquainted with the process of preparing the city for the 2019 Winter Universiade." At the same time, the passengers of "Boeing 737" airlines "Victory", flying to Moscow flight 418, were not released from the plane, because at this time in the airport was supposed to sit on the presidential board. In addition to the passengers did not look at the president, the man entered the salon of the aircraft and silently closed all curtains and portholes from one of the parties. According to information from Krasnoyarsk Yemelyanov airport, on the morning of February 7 an hour or more was delayed departure of 15 flights. Everyone who had transplants, the airline promised to compensate for the costs.